The University announced a new dining plan that will not require freshmen to spend dining dollars at on-campus eateries. Hatchet file photo by Dan Rich | Contributing Photo Editor. Freshmen will no longer have to spend mandatory dining dollars at J Street. Starting this fall, GW will switch to an open dining program that will not require first-year students to spend a minimum amount at on-campus dining locations, according to a University release. The new plan restricts dining funds to food purchases at more than 90 different partner restaurants and grocery providers, the release said. 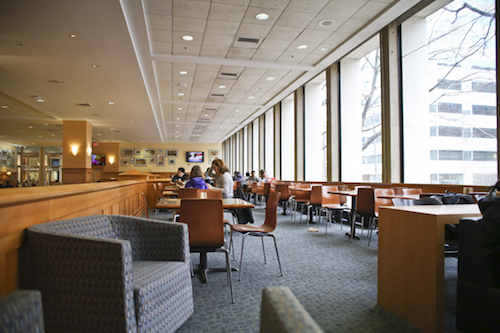 Restaurant Associates will replace Sodexo, GW’s current dining provider, on Aug. 1. Restaurant Associates will supply Mount Vernon Campus dining operations and University catering starting next academic year, the release said. GW’s 10-year contract with Sodexo expires this spring and five companies had applied to be the University’s next food provider. Restaurant Associates estimates fewer than 10 Sodexo staff members’ positions will be cut, according to the release. Nancy Haaga, the managing director of campus support services, said in the release that the Division of Operations will work with both companies to help current Sodexo hourly associates transition to a new management team. “It’s important to us that the current Sodexo employees understand the transition and have a successful transition—many of these workers have served the GW community for a long time,” Haaga said. Alicia Knight, the senior associate vice president of operations, said in the release that students have had concerns about dining variety and affordability, which the new program will aid. District House, the University’s newest residence hall, will include five dining venues. University officials are in the process of narrowing down potential vendors, which are set to open with the residence hall this fall. Officials are also considering mobile and interactive options for the new dining program, including an online search for students to look up partner restaurants, according to the release.